Fancy going on a nice short trip in the summertime to explore one of Berlin’s most beautiful lakes? Why not take the ferry if you don’t want to rent a boat. It is cheap and it takes you to two of the nicest places in the city, as it operates between Wannsee and Alt-Kladow, one of the oldest parts of Berlin. From here, you can explore this little village which is situated at the river Havel and take some short trips to wonderful lakes as well as explore the Gutspark Kladow on bike or per pedes. In Alt-Kladow you will find the Glienicker See, the lake which for decades has had the cleanest swimming water in all of Berlin, and if you want to fish, you won’t be disappointed either. 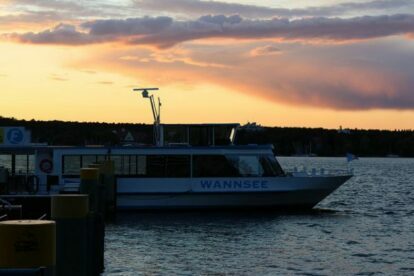 In Wannsee you can visit a lot of important monuments like the house of the Wannseekonferenz and pass by marvelous beaches as you cycle your way all into Berlin’s neighbor city Potsdam, with its impressive architecture and even more impressive nature. All in all, the ferry ride takes about twenty minutes, but will leave a much longer lasting impression on you. Offline Berlin tips? Get our iPhone / Android app!